This is possibly the most spectacular and popular trekking route in Bhutan, which leads from Paro to Thimphu or vice verse, Traversing mountain passes, through lush green valleys and passing several small high altitude lakes. You are likely to spot the rare blue poppy besides other exotic flora. The duration of the trek ranges between four and six days and it is a moderate difficult one with the maximum altitude reached being 13,776ft/4200m. the area is famous for its spectacular rhododendron forests, which bloom in May. In the clear weather of late autumn and winter there are great views of the Himalayas. Your Guides from Yatra Bhutan Tours and Treks will receive you at the airport with Tashi Khadar and drive you the short distance to the hotel. After breakfast visit to the watch tower of Paro Dzong which now houses the National Museum. The museum is an important center for the preservation of Bhutanese artifacts, culture and history. Then, we continue to Rinpung Dzong (or Paro Dzong), which means “the fortress of the heap of jewels.” This complex houses the administrative and religious headquarters for the Paro district. A part of Bernardo Bertolucci’s movie, “Little Buddha,” was filmed inside this Dzong. From the Dzong, we will enjoy a short and easy walk to the Pachu river and cross to the other side over a traditional cantilever (wooden covered) bridge after lunch Drive to Drukgyal Dzong, a ruined fortress which is 16 km away from Paro Town. Although in ruins, this Dzong is of great historical importance. It was here that the Bhutanese finally defeated the invading Tibetans and drove them back. From here, the peak of Jumolhari ‘Mountain of the Goddess’ can be seen on a clear day (Alt. 7,329 m /24,029 ft.). And on the way back visit Kichu Lhakhang is the oldest and the most sacred shrine of Bhutan built in 8th century by the Tibetan King Songtsen Gampo. In the evening take a leisurely stroll in Paro town. Today you are heading to Jangchuk Lhakha camp. It is 4/5 hours trek and campsite is at 3780 meters at the maximum. You are gaining around three hundred meters high. The trails starts 200 meters uphill to Jeli Dzong, which served as the rest house during the 2nd King ‘s time and now a monastic institute. The trail is mostly up and down with good views of Paro valley on your left side as you walk on the ridges. Forests that with high temperate and some alpine meadows. In this last day to Phajoding camp we will come across the Lake Janetso and semkotatso. All the lake in this trek has trout. 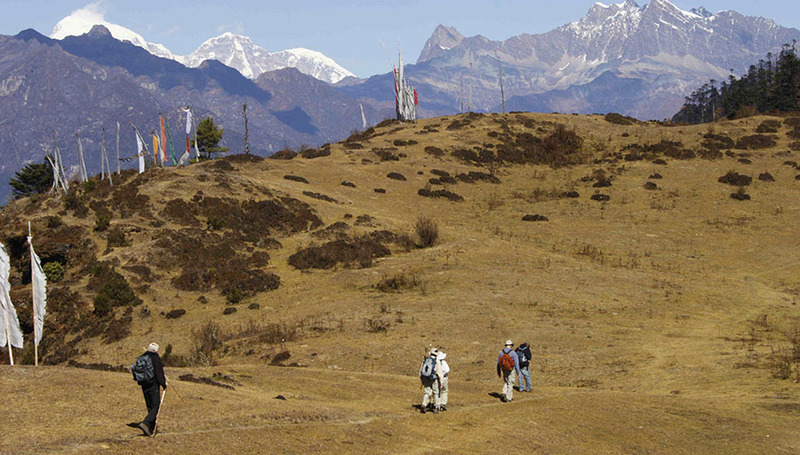 Great scenic view can be seen on clear days most of the Bhutan’s snow capped mountains. When you look at northeast. After reaching the Phajoding Pass, enjoy a great view of Thimphu capital valley and down hill till campsite. Otherwise you can start late and visit some old temples there. The sunrise view from Phajoding is great with Thimphu valley just below you. Many pheasants can be seen if you take a little morning walk around the hillside. After breakfast drive to Thimphu and visit the National Memorial Chorten (1974) built in honour of our late King Jigme Dorji Wangchuk, “The Father of Modern Bhutan”. Built in a typical Tibetan style, there are numerous religious paintings and the complex tantric statues reflecting both the peaceful and wrathful aspects of Buddhist deities. This Chorten is also a center of worship for the people living in Thimphu. Then visit to Dupthop Lhakhang one of the few surviving nunneries in Bhutan. Visit Changkha Monastery (This monastery was built in 15th century by the lama Phajo Drugom Zhipo) where the new born child of Thimphu valley are taken to receive 1st blessing from a High Lama. Drive to Mini Zoo where Takin, the national animal of Bhutan can be seen. This particular animal is found only in the Himalayan region and the head of this animal looks like that of a goat and body of a cow/yak and before sun set drive to Sangay gang view point (2685 meters) to have view of whole Thimphu valley and walk through hundreds of colorful prayer flags that dot the hill over looking the Thimphu valley. Dinner and Overnight in Hotel at Thimphu.